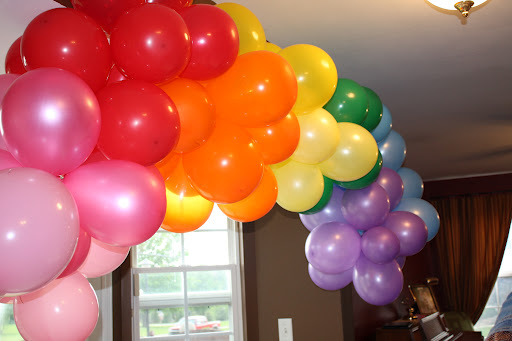 The Balloon Garland came from here. 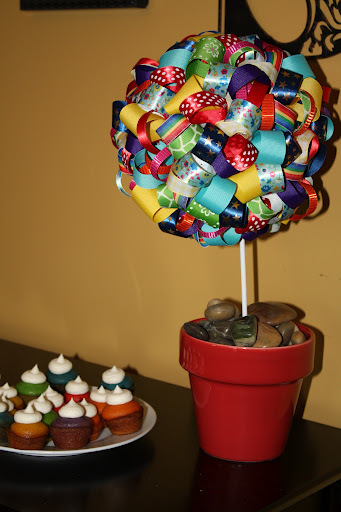 I saw this ribbon decoration here. I loved it and knew Lucy would too! 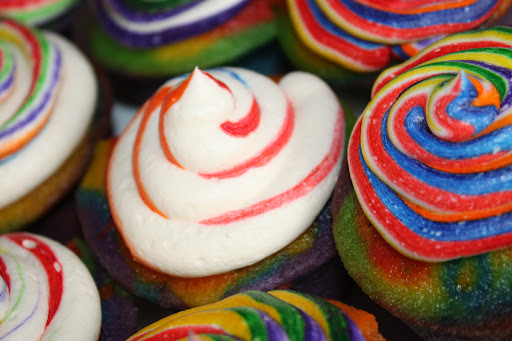 The rainbow cupcakes came from here. 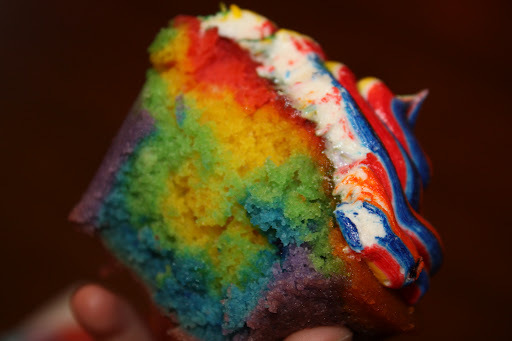 I was just experimenting when I made the frosting. I prefer the cupcakes with more white icing and just a little bit of color, but as I got to the end of my bag of frosting, the color came out thicker. I debated over drinks for the girls. I saw several ideas about getting different colored drinks, but with only 12 girls, I didn’t want all the sugary drink leftover. I ended up buying sugar free packets of kool-aid. 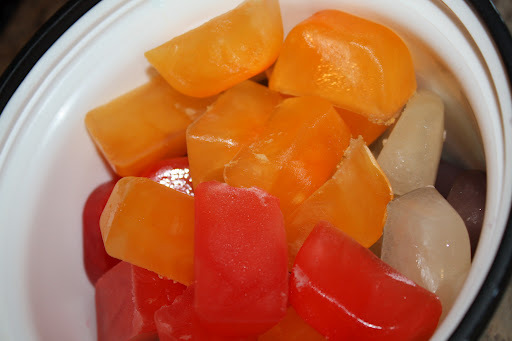 I mixed up each color and poured them in ice cube trays. I made lemonade, too. I thought is was really fun to see the girls faces light up when they saw the colored ice cubes – and as their lemonade changed colors. Here’s the birthday girl!! I can’t believe she is going to be 6 this week!!!! AHHH! While this week was CRAZY with soccer and Boot Camp Challenge and this weekend is CRAZY with more soccer and more Boot Camp Challenge, I knew today was the best day to fit in her party. 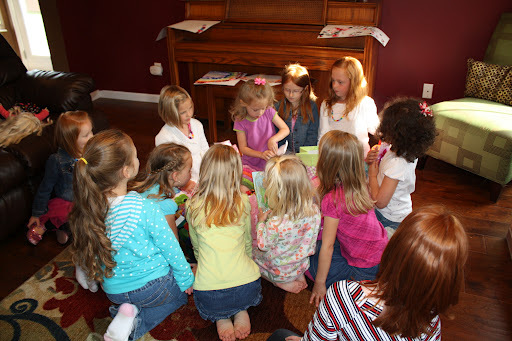 The girls seemed to enjoy themselves and Lucy was THRILLED to finally have a friend party!! Her actual birthday is Tuesday – I will post more about Lucy then!! Below you will find 2 pictures. . . 2 very different pictures. One shelf belongs to Lucy and one belongs to Norah. Based on the types of books, you would know that the first picture is Lucy’s and the second is Norah’s. This gives you a little clue about their personalities. I don’t know if it is a first born thing or not, but Norah prefers to keep things straightened up and organized. Lucy, as evidenced in the picture, is the EXACT opposite. You will find her shoes and socks all over the house – she leaves them wherever she drops them. If she is writing/drawing with markers – she will leave everything out in the exact same spot until she is told to put it away. When she does her school work, she leaves everything out all over the place. Looking at the shelf makes me chuckle – well, drives me a little bit crazy, but also makes me chuckle. Why? She is so much like me. Most of you who have regular contact with me and see my house may not believe it. I try very hard to to keeps things organized and clean. . . but the inner slob of my childhood is often fighting to come out. My parents and certain friends from high school will remember what my bedroom looked like. . . my friend, Janelle, often came over and helped me clean my room so I could actually go out for the evening. I still leave my shoes all over the house. If I am at the table and I kick my shoes off, I will leave them right there until I need them again. If I am in the basement doing school with the kids and I take them off, I leave them right there. All this to say, while Lucy has always favored Kevin in looks and actions – this one thing, I can claim because Kevin is more like Norah. I will help Lucy fix the shelf, but it won’t stay straightened and I will continue to get a kick out of it every time I walk by it. Well, as usual, life has been crazy. From talking to everyone else around me, this seems to be the norm. Some days, I wish life would slow down, but I don’t think that is possible with 3 kids! We have had a lot of fun over the last several weeks/weekends – but we are looking forward to several weekends at home!! Norah continues to LOVE reading. This girl spends HOURS a day reading! She usually reads about 30 minutes during our school day, then at least an hour during their independent quiet time and then about an hour before bed. She totally zones everyone and everything out while she reads (gets that from me!!). The tricky part is finding books that are challenging enough, but has age appropriate content for a 7 year old. She loves the Boxcar Children! She insists on reading them in order so she often has to wait for one to be returned from the library! She also has read several books from the Classic Starts set and Illustrated Classics. She also continues to question the need for spelling in her school day. I am constantly telling her that spelling is one of those things that you just have to do to be a better writer. My question – would anyone really say that spelling was their favorite subject? However, it is still important!! Norah is really into making tents or forts. She often has blankets draped over pieces of furniture! Kevin made the girls a teepee this year so they play in that often too! Lucy is slowly adjusting to her school schedule. 5 days a week has been a major adjustment for her – by Friday she has lost a lot of focus and really doesn’t want to do much school!! 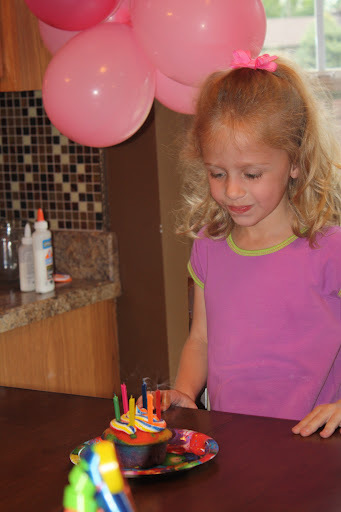 She loves math – totally the opposite of Norah! She is really doing great with her reading. She has read all of the Fun Tales and is working her way through the Bob Books. Lucy’s most recent fascination has been with making paper dolls. She literally makes them from scratch on cardstock and they are so cute! She has about 40. Yes, 40. She worked so hard!! Lucy is 3 nights in to breaking her finger sucking habit. . . again. This time seems better already! She seems to get it this time and is really trying – even during the day. She is wearing gloves – just like Norah did. I know it seems cruel, but the dentist confirmed that this is the best way to go about it and knowing Lucy is probably not far from losing teeth, we knew we needed to start working on it. Lucy LOVES to dress-up and dance. She usually has a princess dress on and is twirling to the music. Her favorite cds right now are this one and this one. Let me tell you how funny it is to watch her twirling to God Bless America in her princess dress or leotard. She belts it out as she sings too!! I don’t even know where to begin with Daphne. Wow – she is a spit-fire. She has tons of personality and she is constantly cracking everyone up!! “Mom, you go to p**pcamp today?” She says this everyday and cracks herself up every time! “You not feat me. I mustateer!” (quote from Barbie “you cannot defeat me for I am a muskateer”). “I not weawy hungwy! !” – She tells me this at every. single. meal. not kidding. However, when you are almost 3 and still only weigh 21 pounds – we do not negotiate at meal time! “I not have to go p** p**” – She tells me this whenever I tell her to sit on the potty. every. single. time! Oh, and she screams it! “You want bwaid or pigtails?” Brushing my hair is one of her favorite things to do right now – and she is surprisingly gentle. Funny story – this morning our church had its annual serve day. We were at a local park painting picnic tables. The kids helped part of the time and played part of the time. When we finished painting the kids were all playing and I was trying to round them up. Daphne didn’t want to leave so I told her, “Let’s go see what daddy is doing.” Kevin was down a little hill under the pavilion. I picked her up and started walking toward him. She started yelling, “Not that way, this way” while pointing the opposite direction. I said, “Daddy is down here.” She replied, “I not see that daddy. I see my other daddy” and she points at some random man playing with his kids. This picture was totally not posed!! I walked into the living room and saw Daphne like this. No one else was even watching yet!! I have tons of pictures to post from the last couple of months so I will hopefully get to those soon!! Lucy is working on graphing for her math. Can you take a minute and answer her questions in the right sidebar? Thanks! On the one about vacation – if you choose other, please leave a comment telling us where you would go? Here it is – our curriculum list for this year. My Father’s World for reading and Bible. We are also using this to help with sight words. Lucy will also do a few activities suggested in Games for Writing. Lucy is joining Norah for history, art, and science. Her read alouds come mostly from this list. I think that about sums it up – although, I keep thinking I am forgetting something. Our history this year is American history – the girls are excited about it. They can’t wait to learn about the pioneers! I will save Daphne’s plans for a post of its own. We spent the weekend in Indy with Kevin’s family. His mom’s 60th birthday is this week so we had a little surprise party for her. She knew we were coming over, but didn’t know there would be a party when she got home from work. The kids loved surprising Linda! They were giddy and giggly while we waited for Linda to get home!! Saturday morning – everyone headed to the parade for the Indy 500. Well, everyone except Daphne and me. Daphne didn’t nap on the way to Indy on Friday and didn’t sleep well Friday night so she needed to stay home and nap. And nap she did – she slept for almost 4 hours while the others were gone. Sunday – all the girls headed to church while all the boys went to the race. We had Monical’s Pizza for lunch – can’t pass that up when it is an option. Shawna and I headed to Half Price Books while Linda played with all the granddaughters. Ummm, I love this bookstore and so wish we had one in STL. I bought a bunch of chapter books for Norah – 12 for $21. Love it! Sidenote – not sure what the deal is but one or more of our kids get sick whenever we go out of town. Ergh. Norah is wheezing and running a fever, which means we may be heading to the doctor in the morning. Hopefully, this won’t last long!! Oh – and I am potty training this week. Daphne is ready so we are going to go for it.